For the 2017 model year Chrysler condensed their lineup into three models, the full-size luxury sedan, the Chrysler 300, the nation’s leading minivan, the Chrysler Pacifica, and a hybrid version of that minivan, the Chrysler Pacifica Hybrid. Each of these vehicle’s offer consumers comfort, convenience, and a smooth and powerful ride. A robust vehicle in its own right, the Chrysler 300 is available as a rear-wheel-drive or all-wheel drive sedan. Available in five trims, consumers have the choice of the 300’s bold classic design, or they can opt for a more sporty look with the available Sport Appearance Package, that includes a black chrome grille surround, premium LED fog lamps, body-color fascias, and a body-color rear spoiler. Looks aren’t all the 300 is known for though. A peak performer in its class, the Chrysler 300 averages 30 mpg on the highway, and that makes the 300 the best-in-class for driving range with a V6 engine. The interior of the Chrysler 300 is more of a luxury sedan than the average sedan. Roomy and sophisticated, consumers admire the 300’s convenience features and amenities. With heated and ventilated front seats optional and an available sunroof, how could it not be? Add in the modern technology, including Uconnect 8.4, Apple CarPlay, and Google Android Auto, and this is one sedan to set the standard for 2018 models. An award-winning minivan since its debut, the 2017 Chrysler Pacifica has been turning heads for the past year. 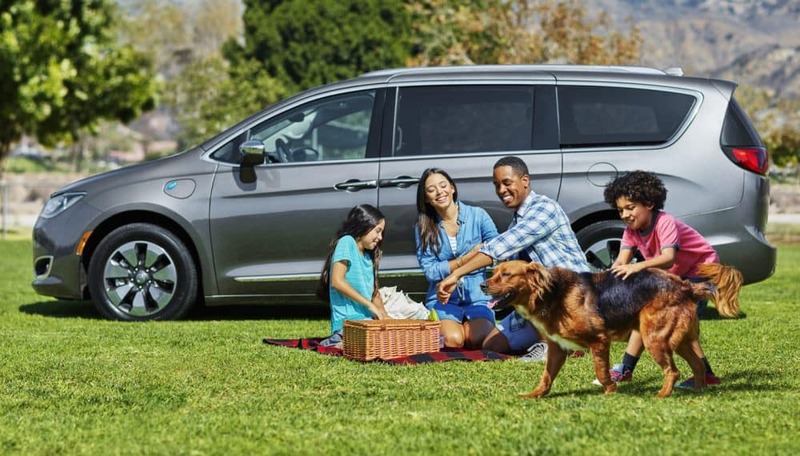 The Pacifica replaced the Chrysler Town & Country, and although a minivan, it is sought by consumers of varying age groups – this isn’t just for families, although many of its family-friendly features are the most talked about. With seven or eight passenger seating and the available Uconnect Theater available, including the useful “Are We There Yet?” feature, parents can keep the kids occupied on any road trip with the Pacifica. Like the Town & Country, the Pacifica also has FCA’s innovative Stow ‘n Go storage seating system, which makes it easy for users to fold the second- and third-row seats into in-floor storage compartments. The Stow ‘n Go storage seating system is a great way to arrange seats when transporting cargo, but when the seats are not folded down, the in-floor compartments can conveniently be used for additional storage space for other items. Set up with the latest entertainment and safety tech, and with its best-in-class 28 mpg on the highway fuel economy, the Chrysler Pacifica is a hard minivan to beat. The Pacifica is hard to beat unless we’re talking about its hybrid variant, America’s first-ever plug-in hybrid electric minivan, the Chrysler Pacifica Hybrid. With a fuel economy of 84 MPGe when the vehicle uses electricity and gas, a 33-mile electric-only driving range, and a 566-mile total driving range, the Chrysler Pacifica Hybrid goes far! Plus, consumers don’t have to trade one function for the other – the PHEV has all the functionality of the regular Pacifica (minus the second-row Stow ‘n Go seats because of the vehicle’s battery). For those of you with a 30 mile or less commute, know that the lithium-ion battery can be charged in as little as two hours with an available 240-volt Level II charger. That means the Chrysler Pacifica Hybrid minivan can be used an all-electric vehicle if desired. This means getting all the modern tech and safety features found in the Chrysler Pacifica while also being able to go a little green and lessen one’s carbon footprint. Go Earth! Don’t forget about federal tax credits the Pacifica hybrid and other alternative fuel vehicles provide, ka-ching! These three vehicles are pretty solid, meaning they’re the best Chrysler has on the table after cutting out lesser vehicles in the lineup. What’s next for Chrysler we wonder, but if any of these vehicles have piqued your interest, you can find them in our inventory today.